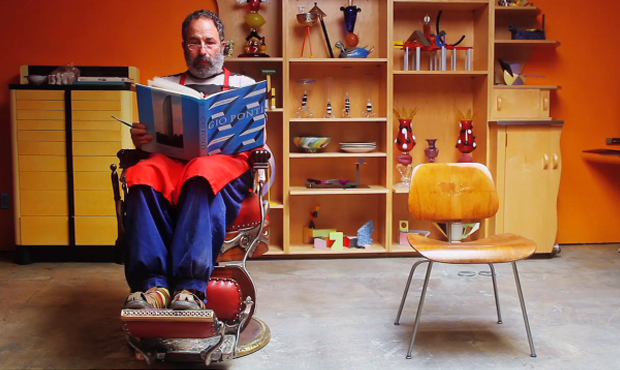 The good folks at South Willard put me onto this fantastic video based on Los Angeles based artist Peter Shire. Funnily enough last week I was actually browsing Peter’s website and it struck me how playful and comedic his work is, it’s great to know that he doesn’t take life too seriously and that he’s always experimenting. We’ve probably said this many times before about the companies we like but in this workshop/studio you can definitely see a link to the Eames type mentality. I also like how Peter isn’t restricted by a particular material, for example if you go through his website you can see furniture, ceramics, steel work, and even glass work. Great stuff, I think that’s something that’s really rare to find these days. This particular film was put together and shot by Eric Minh Swenson and documents the running up to his exhibition at the Lora Schlesinger Gallery in California. The exhibit is called “CUPS” and yep, you guessed it, it will showcase a selection of ceramic cups which have been made by Peter over 30 years, specifically between the years 1974 – 2012. Although you may think something like this would be boring, “hey, it’s just a set of cups? !”, well when you watch this video you will understand why people are attracted to his works. He’s very much an abstract artist with a unique way of thinking, pushing the boundaries of clay and for nearly four decades has been making teapots, cups and other functional items found in a domestic setting with atypical designs. The whole concept behind the works is to challenge the idea of form versus function, to create sculptural pieces which would occupy a normal setting in the home. Now this is quite intriguing for me because as many of you know I’m a massive fan of functionality and I think that stems from my path as a designer rather than from the fine art sector. But I’ve got a massive appreciation for handiwork and craft so it puts me in limbo land if I’m totally honest. I think what Peter Shire offers is another view point on these items, and actually looking at some of his abstract works they really are eye pleasing and are certainly quirky and unique. Overall this film is an amazing watch and will fill your morning with a lot of joy. It set me up perfectly for a day of experimentation and idea generation. As you’re watching I would certainly recommend thinking about the ideals in his workshop and how these tie to designers of the past. I think you will find Peter has a lot in common with these guys and girls. Watch on below.